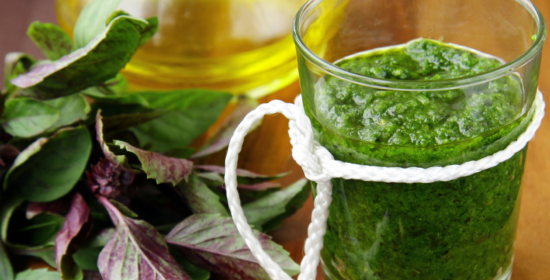 Dairy free Paleo Pesto is also perfect for a raw vegan diet. This lower calorie pesto is great for weight loss. Make this gluten-free with zucchini noodles. Pesto adds a punch of flavor without a lot of calories. Great on grilled vegetables, Panini’s, or wraps. This Plant-based Pesto is also raw vegan. Traditional Pesto and Arugula – Pepita or Pumpkin Seed Pesto recipes follow. DIRECTIONS: wash basil leaves, remove from stems, measure and add to food processor will all the other ingredients. Process until smooth. Mix with lightly steamed zucchini noodles for a Paleo or gluten-free meal. Raw vegan mix with uncooked zucchini noodles. Dairy free Paleo Pesto is also great mixed with your favorite pasta cooked al dente. Serve with a leafy green salad for a low calorie meal that’s perfect for a diet or weight loss. 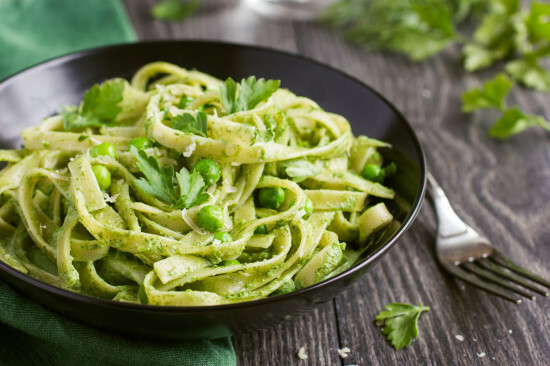 Optional – if you’re not on a Paleo Diet, lightly steam fresh or frozen peas and mix into noodles of choice with the pesto. Store leftover pesto in the refrigerator in a glass container or jar. Leave just enough room at the top to float a little extra virgin olive oil on top of the pesto. To prevents it from browning or drying out. Seal with an airtight lid. Use within 5 days. NOTE: for a different twist try using a different variety of Basil. Like Thai basil, Lemon Basil, Spicy Globe Basil, or beautiful purple colored Opal Basil. Note: for raw noodles, soak in salt water for 1o minutes or longer. Drain before serving. For cooked noodles, lightly steam in a vegetable steamer over boiling water. Or add zucchini noodles to salted boiling water for a few minutes. Cook al dente. Be careful not to overcook. Pour zucchini noodles into a colander to drain water before serving. 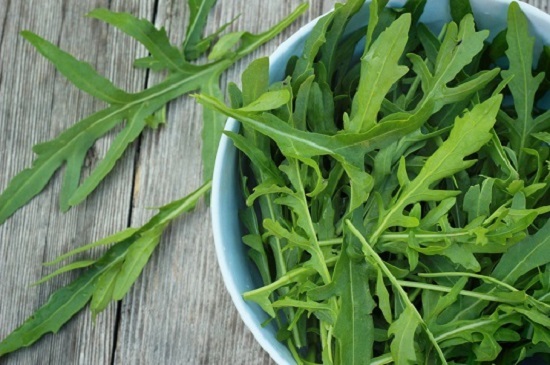 DIRECTIONS: wash arugula, measure and add to food processor along with all ingredients and process until smooth. Store leftover pesto in a glass container or jar that it fills to the top, add a little extra virgin olive oil on top to prevent it from drying out or browning, seal it with a lid, and store in the refrigerator. DIRECTIONS: wash basil leaves, remove from stems, measure, add to food processor with all ingredients and process until smooth. Store pesto in glass container or jar that it fills to the top, add a little extra virgin olive oil on top to prevent it from drying out or browning, seal with lid,store in the refrigerator. Metatags – Dairy free Paleo Pesto is also perfect for a raw vegan diet. This lower calorie pesto is great for weight loss. Make this gluten-free with zucchini noodles.